Detailing the physical features, habits, territorial reach and other identifying qualities of the Five-Banded Thynnid Wasp. The parasitic Five-Banded Thynnid Wasp is good news for flowers, but bad news for beetles. 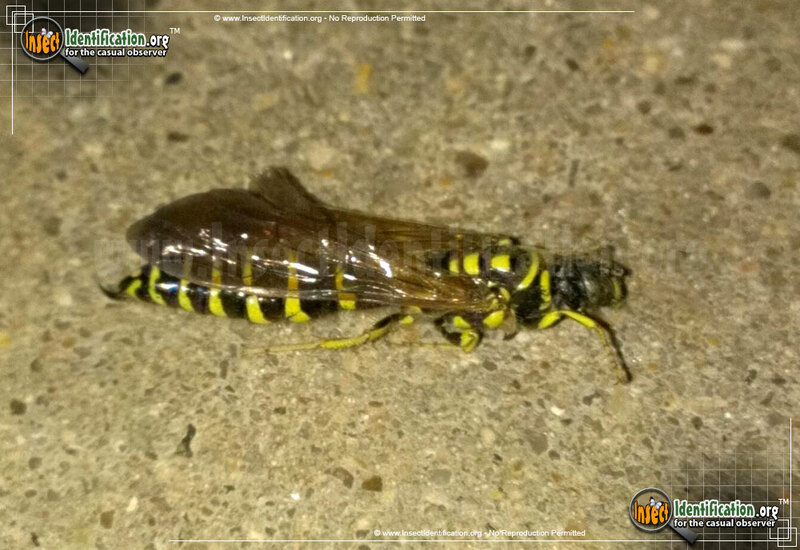 This medium-sized yellow and black wasp is highly beneficial because it preys on a variety of beetles that destroy trees and flowers. Males have a pseudo-stinger at the tip of their abdomen, while females have the real thing. The wings of males are brown while female wings have an orange hue. The offspring of the Five-Banded Thynnid Wasp is the generation that actively benefits plants. A female wasp lays a fertilized egg on a May Beetle larva while it is still buried in the ground. May Beetle larvae feed on the roots of plants, interrupting water and nutrient flow to the rest of the plant. This can lead to stress and death in young plants and grasses. The wasp larva hatches and immediately invades the beetle where it slowly eats it from the inside out, eventually killing it. The wasp larva then matures into adulthood in early summer. As is the case sometimes in nature, this wasp is, itself, a victim of one of its own kind. Velvet Ants, which are really wasps in disguise, eat Thynnid wasp larvae. Adults drink nectar from flowers. They have caused minor leaf damage to trees, but not enough to harm the tree. This species can be found in gardens, meadows, fields, or on lawns.